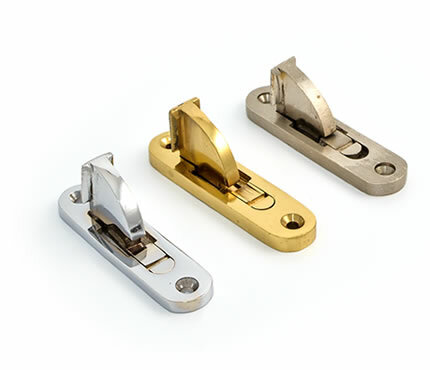 To offer specifiers and fabricators the option to enhance both the levels of safety and security offered by a sash window, Caldwell can supply a range of travel restrictors which limit the travel distance of the sash. For optimum convenience, our travel restrictors are removable, meaning that when required, sashes are still able to open fully to facilitate cleaning or maintenance. For additional ease of use, our travel restrictors can be locked in either a restricted or free position, and are also self-engaging which ensures that when the sashes are returned to their original position, they always re-engage. PE633 VS Travel Restrictor: Featuring new design innovations, the PE633 incorporates a spring loaded tongue which can be fixed in either flush or projecting positions for automatic re-engagement. They are also subtle in appearance, and are equally easy to install both in new builds and retrofit projects. To ensure that they can be supplied to meet a range of aesthetic requirements, they are available in chrome, powder coated white, and polished gold finishes. PE401N Travel Restrictor: Depending on requirements, the PE401N can be installed to limit the travel of the bottom sash typically to 100mm – though this is adjustable through setting the restrictors at varying positions on the sash’s stile. Like the P3663 VS, it also incorporates a spring loaded tongue for self-engagement and for increased strength and consistency, the PE401N is made from die cast aluminium. The PE401N is key operated, and is available in white, gold and chrome finishes. 202 Travel Restrictor: In a similar fashion to the PE401N restrictor, the 202 is key operated, and also restricts the travel distance of the sash (normally by 100mm), though the position is adjusted by altering the restrictor’s position on the on the window’s exterior. Manufactured in aluminium, the 202 travel restrictor is suitable for both vertical and horizontal sliders, and is available in white or anodised silver finishes.